Did you know that inflammation after exercise is a normal, healthy response of the body? In fact, this inflammation response is essential for maintaining whole-body health. It can work like this: In the body’s natural cycle of activity and recovery, blood and nutrients are sent to the area in need. Then, the resulting inflammation can sometimes be felt as occasional pain or soreness. Many people notice this kind of minor pain or discomfort after exercise, like a workout or even a brisk walk. It’s the body’s healthy inflammation response doing its job… but it can be kind of a pain. For soothing aches and pains related to exercise, Zyflamend Whole Body is a holistic, herbal approach. Zyflamend helps balance the whole body’s natural, healthy inflammation response after exercise. Zyflamend delivers full-spectrum Ginger to help relieve minor pain or soreness related to exercise. The whole-food Ginger in Zyflamend also supports flexibility and comfortable movement with complementary Rosemary, Turmeric, and Green Tea. New Chapter’s full-spectrum extraction process captures each herb’s naturally occurring compounds. New Chapter doesn’t break up the herb to pull out a single compound, like some products do. Instead, using both traditional and supercritical CO2 techniques, Zyflamend delivers super-pure, super-potent extracts with the whole Wisdom of Nature. In vitro studies suggest that Zyflamend is a special formulation because its 10 herbs have a natural synergy together. In a pre-clinical model, we tested the power of Zyflamend’s whole 10-herb blend in laboratory studies that measure cellular markers of inflammation and stress. We also tested each herb acting on its own. The results showed the Zyflamend blend of 10 herbs worked better together than the sum of the action of its single herbs. Discover the power of 10 herbs! 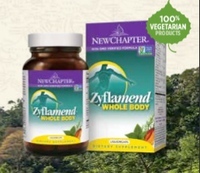 Zyflamend Whole Body, our herbal formula forpain relief† after exercise, delivers 10 herbs with a history of traditional use for supporting health andwell-being. Chinese Goldthread, Hu Zhang, Chinese Skullcap, and Barberry are time-honored tonic herbs in the Chinese tradition. Rosemary and Oregano are native to the Mediterranean region. Zyflamend’s Hu Zhang is a natural source of resveratrol, a part of the healthy Mediterranean diet. Turmeric, Ginger, Green Tea, and Holy Basil are common elements in Asian and Indian wellness regimes. Zyflamend Whole Body uses an innovative delivery system called Liquid Caps, which makes it a 100% vegetarian formula. It’s our same #1-selling herbal blend in a purely plant-based capsule! People choose vegetarian for many reasons, including sustainability for people and planet. New Chapter is committed to sourcing non-genetically modified ingredients. As proof, we proudly place the Non-GMO Project Verified seal on our products, including Zyflamend. The Non-GMO Project is a third-party verification program that helps you select products that avoid GMOs. Zyflamend’s pure herbs are carefully reviewed for GMO avoidance at every link of the supply chain… all the way back to the seeds! To support your whole-body health, Zyflamend goes to the source. New Chapter goes to great lengths to source Earth’s pure ingredients, from super-potent Indian Turmeric, to fine Moroccan Rosemary, to organic Green Tea grown on lush terraces in China. Then we combine our ingredients in a unique 10-herb blend that delivers the full spectrum of natural compounds.